From its origin, Lapwai Creek flows 5.5 miles before discharging into Winchester Lake near Winchester, ID and from there flows in a Northerly direction for approximately 25 miles where it enters the Clearwater River near Spalding, Idaho. Lapwai Creek, a fourth-order stream, is located within Nez Perce and Lewis counties in North-Central Idaho. The Lapwai Creek watershed drains approximately 174,600 acres and is comprised of several tributaries, including Sweetwater Creek, Webb Creek, Mission Creek, Tom Beall Creek, Spring Creek, and Garden Gulch Creek. It is composed of upland plateau and steep canyon habitat ranging from elevations of 785 feet at the mouth to 3,917 feet at the outflow of Winchester Lake (GoogleEarth). Precipitation varies based on elevation, with annual average total precipitation of 24.1 inches in the upland portions and 12.7 inches near the mouth. 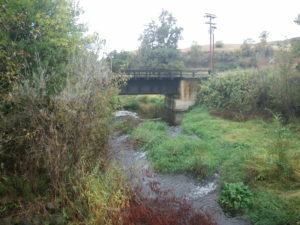 Lapwai Creek passes through several small communities including Culdesac, Sweetwater, Lapwai and Spalding, and is bordered by highway 95 for the majority of its course. This, along with railroad activity has resulted in stream channelization and bank instability (Nez Perce Soil and Water Conservation District (NPSWCD)). The Lapwai Creek watershed is located mostly within the boundary of the Nez Perce 1863 Reservation. However, most of the land is privately owned (86%) with small allotments being Tribal (13%) or State (1%) owned (NPSWCD). The dominant land use in the watershed is agriculture (70%), with areas of coniferous forest lands (30%) (Integrated Basin Analysis). The watershed contains A-run steelhead, resident rainbow trout, fall-run chinook salmon, coho salmon, paiute sculpin, mottled sculpin, torrent sculpin, speckled dace, longnose dace, bridgelip sucker, chiselmouth, northern pike minnow, redside shiner, and smallmouth bass (NPSWCD). 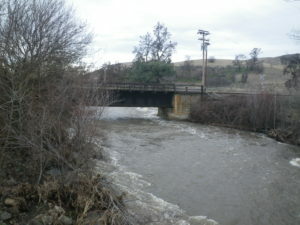 In the early 1990’s, the salmon and steelhead species were listed as either “Threatened” or “Endangered” under the Endangered Species Act, and in 2000, Lapwai Creek and its tributaries (specifically Webb Creek and Sweetwater Creek) were federally designated as “critical habitat” for steelhead spawning (Higgins et al. 2011). Early studies indicate that water quality in Lapwai Creek is limited by extreme annual stream flow variation, low summer flows, high summer water temperatures, and lack of instream cover (Fuller 1985). In 1999, Lapwai Creek was listed on the State of Idaho’s 303(d) list for bacteria, dissolved oxygen (DO), flow alteration, habitat alteration, nutrients, organics, sediments, and temperature. Photos taken in October, 2016, left, and March, 2017, right, show the variation in stream flow throughout the year (near the mouth of Lapwai Creek).